Wow, it’s already time for another set of production notes for Radio Free Charleston already! Our latest show features new music from The Sleeping Dons and The Heydays, as well as a short film by Danny Boyd and our usual animation and mind-hurting weirdness. This episode is called “Captain Action Shirt,” and if you would like your own Captain Action Shirt, featuring the logo from the superhero action figure, you can order it at the Captain Action Cafepress Store. I’ve wanted a shirt like this since I was a kid and had the Captain Action with parachute that always wound up on the roof. I’ve written about the good Captain here, and here. Dressed sort of like Captain Action, I can be seen abusing his nemesis Dr. Evil in the animation intro. We shot the host segments on the grounds of the State Capitol last Sunday, taking advantage of the wonderful Indian Summer, which sadly seems to have left us. Melanie Larch directed and shot the host segments this time. The musical performances and animation were directed by yours truly. TV Tabloid comes to us courtesy of Danny Boyd. This short film was made at West Virginia State College about twenty years ago, and we’ll be seeing more of Danny’s work in future shows. The animated opening for this bit was done by my brother Frank back in his pre-computer days. Our first musical guest is The Sleeping Dons, back for an encore after treating us to the Native American baseball tune, “Story Of The Coyote People” on our second show. This time around they give us “Wild River,” which was featured as the Song of the Week here in PopCult back in June. This video showcases the band set against a montage of illustrative footage of rivers and nature, which was necessary when we lost two camera angles in a hard drive crash. We brought The Heydays into Livemix Studio a couple of Fridays ago, following their performance at Taylor Books. It was the first time that our esteemed Gazz Editor, Douglas Imbrogno, had been up to the musical home of RFC. Doug and master guitarist Paul Callicoat are The Heydays, and in this episode they perform their arrangement of “Shady Grove.” In a future show, we’ll bring you a semi-animated video of one of their original songs. A different mix of “Shady Grove” will be the Song of the Week here at PopCult in a couple of days. That’s the behind-the-scenes dirt, now go watch the show. We’re going to be gearing up for our special Christmas and New Years episodes. Keep reading PopCult, and stay tuned to Gazz TV for details on when those shows will appear. What a fine show. The music was right up my alley. Will you let us know when the Heydays and the Sleeping Dons are playing out next? The short film with Danny Boyd was hysterial, and it looks like you had a really beautiful day to shoot your introductions. You made the State Capitol look much cleaner than it looks in person. I can’t wait to see what you have in store for the Christmas episode! Cool shirt, too. I’m going to have to get me one of those. edgy like southpark…that`s what you are goin for,rite? Great Show! Would love to see more original animation…. 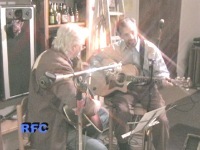 opportunity to play music together in 2007!!! and enjoyable format you’ve given to all of us!!! You’re great people! Good luck in 2007 and beyond!